Kenya's President Uhuru Kenyatta, left, and opposition leader Raila Odinga of the National Super Alliance (NASA) coalition shake hands after a joint news conference in Nairobi, March 9, 2018. Kenyan President Uhuru Kenyatta and opposition leader Raila Odinga met Friday in an apparent effort to settle months of violent post-election tensions. The meeting came just hours before a visit by U.S. Secretary of State Rex Tillerson. In the surprise meeting, Kenyatta and Odinga agreed to work toward unifying the country after last year’s divisive presidential election. The two – who, after their meeting, appeared together to give separate statements to the press – acknowledged the country was heading in the wrong direction. Odinga, who has refused to recognize Kenyatta as president, paraphrased U.S. president Abraham Lincoln. He said Kenyans needed to know where they are and where they want to go before they can better judge what to do and how to do it. "Fifty-four years since independence, we are challenged to audit our progress toward the ideals for which our fathers fought to establish a free and independent country and for which many of our compatriots died." As leaders, said Odinga, they had a duty to reflect on their performance in reaching Kenya’s goals since independence: justice, unity, peace, liberty and prosperity for all. Kenyatta said the two men came to a common understanding that for Kenya to come together, its leaders must come together. "And this is what me and my brother have agreed," Kenyatta said, referring to Odinga. "That starting today, we will begin a process of bringing our people together. That we will begin a process discussing what ails us and what creates division amongst us." 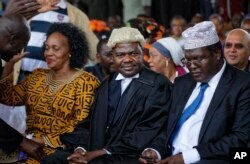 FILE - Lawyers Miguna Miguna, right, and Tom "T.J." Kajwang, center, attend a mock "swearing-in" ceremony for opposition leader Raila Odinga at Uhuru Park in downtown Nairobi, Kenya, Jan. 30, 2018. Miguna Miguna, a prominent Kenyan opposition lawyer and politician who was deported to Canada in February, denounced the Kenyatta-Odinga reconciliation. In a statement posted to Facebook on Friday, he called the rapprochement "a fundamental betrayal of the innocent Kenyans who have lost their lives" supporting Odinga in several elections over the last decade. Last fall alone, Kenyan security forces killed at least 55 people in election-related violence, according to Human Rights Watch. Miguna, whose deportation was ruled illegal by Kenya's High Court, said in his statement that he would return to Kenya on March 26 "to continue the struggle for electoral justice…." On the streets of Nairobi, Kenyans also welcomed the leaders’ agreeing to work together. Another man, Philip Ndung’u, also seemed encouraged by the leaders' meeting. 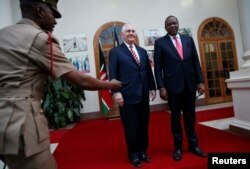 U.S. Secretary of State Rex Tillerson, left, and Kenyan President Uhuru Kenyatta pose for photographers after meeting at the State House in Nairobi, March 9, 2018. Kenya was plunged into political crisis after the Supreme Court annulled the August presidential election, due to irregularities, and Odinga and his supporters boycotted a second round in October. Odinga refused to recognize Kenyatta’s win; in January, he held a rally where his supporters symbolically inaugurated the opposition leader as president. Observers feared further division would follow the provocative action and the government’s crackdown on independent television and the opposition. Friday’s breakthrough came just hours before U.S. Secretary of State Rex Tillerson's first official visit Kenya. That's not a coincidence, said independent political analyst Martin Andati. While Andati called the agreement on unification significant for healing Kenyan politics, the devil will be in the details. We need to understand what exactly has been agreed upon, he said, noting the Kenyan leaders’ statements contained only generalities.